Reagan's father, Jack, was a lapsed Catholic. Ronald's brother Neil was baptized into the Roman Catholic Church but Ronald was baptized into the Disciples of Christ. His mother, Nell, was baptized into the Disciples on 27 March 1910, less than one year before Ronald's birth. At age 19, Ronald left the Disciples, claiming the Catholicism of his father. However, even if he said this, Ronald was never baptized Catholic and did not join any Catholic denomination, so it is most probably an act of rebellion rather than belief. All that can be said for certain was that Reagan was a Christian. 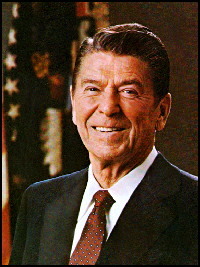 See Lou Cannon, Governor Reagan: His Rise to Power (2005), pages 14-16. Also see Nicholas Wapshott, Ronald Reagan and Margaret Thatcher (2007): "Although my father's attendance at mass was sporadic, my mother seldom missed Sunday services at the Disciples of Christ church in Dixon. From my mother, I learned the value of prayer, how to have dreams and believe I could make them come true."